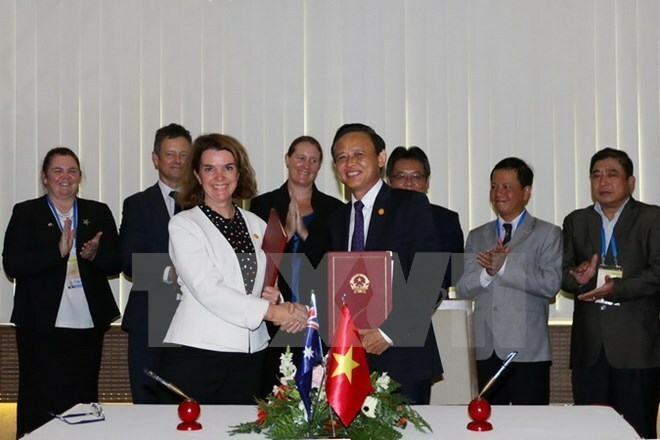 Sydney (VNA) – Agricultural cooperation opportunities, particularly increasing joint-venture investments between Vietnam and Australia are absolutely huge, Assistant Minister for Agriculture and Water Resources Anne Ruston told Fairfax Agricultural Media on August 28. The Australian Centre for International Agricultural Research has invested nearly 100 million AUD in over 170 collaborative research projects in Vietnam, ranging from livestock production to policy development, food safety, fisheries and forestry, she said. Vietnam is really open to Australia in agricultural investment, she underscored. Australian and Vietnamese two-way farm trade is currently worth 2.8 billion AUD with Australian agricultural exports to the growing market valued at about 1.5 billion AUD in 2016-2017, comprising 712 million AUD in grains, oilseeds and pulses and 242 million AUD in feeder and slaughter cattle exports. She expressed her delight at her trip in coincidence with the agreement between the two nations on shipping Australian cherries to Vietnam and Vietnamese dragon fruits to Australia.